Most of the cooking for this deeply flavoured main-course casserole can be done up to two days ahead of serving. In fact, the flavours develop and mellow overnight. Be sure to reheat the casserole thoroughly before putting in the oven with its cheesy topping. Preheat the oven to 180°C, gas mark 4. Toss the lamb in the flour. Heat the oil in a large pan, add the onions and fry gently for about 10 minutes, until the onions are softened and lightly browned. Remove from the pan with a slotted spoon and set aside. Add a little more oil to the pan if needed. Add the meat and fry it all over until lightly browned, in batches if you prefer. 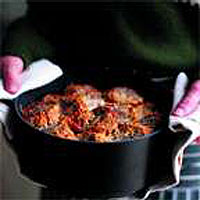 Return the onions to the pan and stir in the beer, stock, celery, herbs, sugar, Worcestershire sauce and tomato paste. Bring to the boil, stir, reduce the heat to a simmer, cover and cook gently for 1 hour. You will need a large casserole dish or an ovenproof dish wide and deep enough to take the bread topping. Taste the casserole and adjust seasoning if necessary. Stir in the mushrooms and transfer everything to the ovenproof dish. Toast the bread on both sides, then spread one side with mustard and arrange the slices overlapping, mustard side up, over the casserole. Sprinkle with the cheese and bake for 20-25 minutes, until the topping is crisp and golden. Serve from the dish with pumpkin gratin. Make the casserole, omitting the mushrooms, up to two days ahead, cool, then transfer to a container, cover and chill. It can also be frozen for up to two months. To reheat, tip into a saucepan or flameproof casserole and bring slowly to the boil, then simmer for 10 minutes. Stir in the mushrooms and continue at step 4.